Skinny Jeans & a Chai Latte: Food & Beer Friday :: Originating from South America. Food & Beer Friday :: Originating from South America. 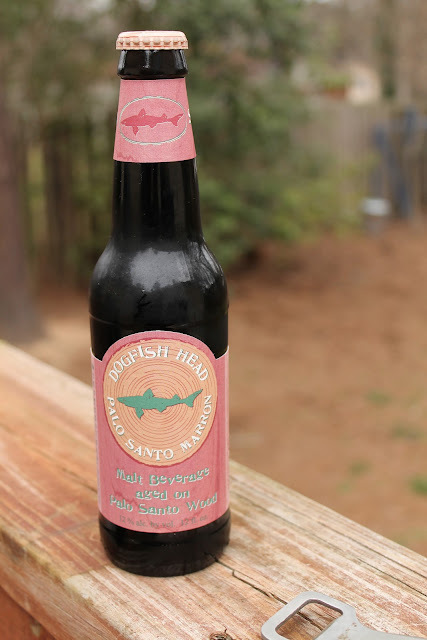 I've featured another Dogfish Head beer only once before, but crazily they have some of my top ten favorite beers (one day I'll feature this one that I adore so, so much). It's actually been a really long time since I've had the Dogfish Head Palo Santo Marron, but it certainly didn't disappoint. 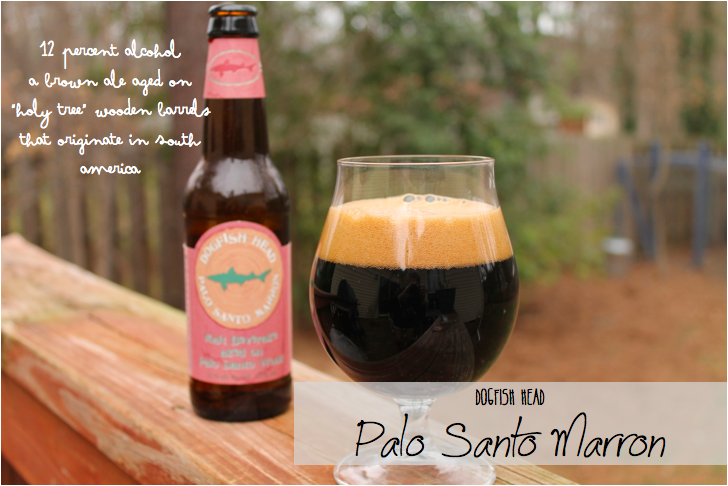 The Palo Santo is an unfiltered brown ale that comes in at a high 12% alcohol level. Brown ales are one of my favorite types of beers. The beer is aged in Palo Santo wood. 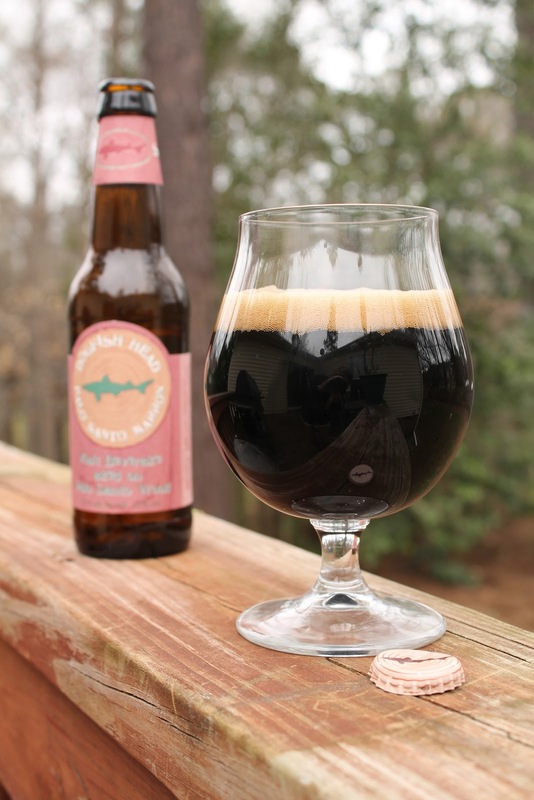 Dogfish Head boasts that the caramel & vanilla flavors are contributed to this wood. The barrels are constructed from the Palo Santo, meaning "holy tree," wood that comes from Paraguay. Apparently this wood is also used to build wine barrels used in South America as well. Enough about the details, let's talk about the beer. The beer is a rich, dark brown with a creamy caramel head. This brew definitely hits the mark as a much...richer version of a brown ale. It's malty with not too many hops coming through. I didn't get a lot of those caramel and vanilla flavors, but let's chock that up to my flavor-challenged palate I've mentioned. Even though I didn't get those dessert-type flavors from this beer, I had no problem pairing it up with some chocolate! I received this Ghirardelli chocolate as part of a giveaway package from Stephanie. I am not into chocolate that much, but you guys...this is delicious! It was a great pairing that brought out some of the sweeter flavors within the beer. Even if you don't try the beer, try the chocolate! 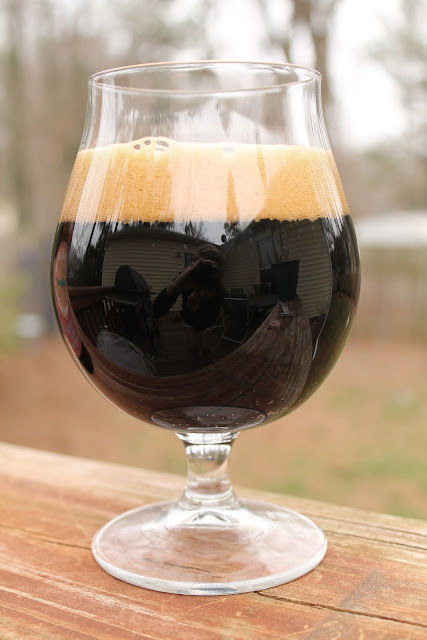 What is one of your top ten favorite beers? Ps. As of April, I'll have Sarah of Exploring Woods co-hosting Food & Beer Friday with me. We're going to be making this super official with a weekly link-up. Get ready for a new button, and go get to know Sarah (she's a pretty awesome beer lover!). I love Dogfish! I can't say that I've ever had a bad beer from them! And I totally agree with your review o the Palo Santo - it's SO good!!! dogfish is becoming one of my faves! I think you're so cool. I don't know what it is, but between your beer interest and your chickens, I wish we were friends in real life and could hang out. I love Dogfish, and I love beer. Whenever I want to drink beer and other people are drinking wine or mixed drinks, I just go for it and remember that it's okay to be a beer girl. OOO! There's a dogfish head I haven't tried?! I need to track this down! Thanks girl! Have a good weekend! LOVE everything Dogfish Head, so I'm definitely going to have to give this a shot. OOOHHH! A link-up eh? I'm looking forward to that! I'm loving your beer profiles! I am no stranger to beer but you are opening my eyes to all the great stuff that is out there. I would normally be terrified of this one because it is so dark, but I'm game to try it paired with chocolate! Food and Beer Friday sounds like heaven, but also (guiltily) like my everyday!